One of the more revolutionary accomplishments of Hogshead Publishing back in the 1990s was the New Style line of brief pamphlets offering extremely innovative RPGs and story games – major experiments often moving entirely out of the traditional tabletop RPG format and forming a precursor to the wave of indie RPGs and storygames that would be unleashed in the subsequent decade by the Forge. 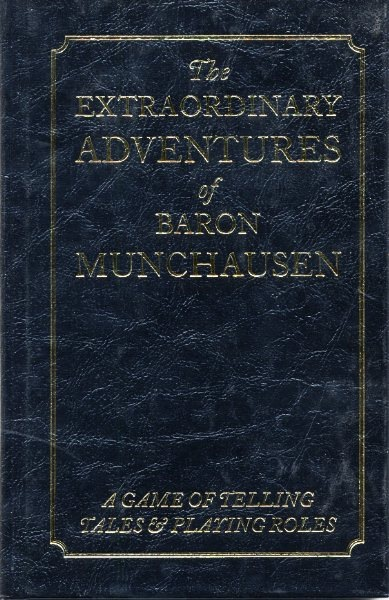 The premier release in the line was James Wallis’ The Extraordinary Adventures of Baron Munchausen, a second, expanded edition of which he issued through his own Magnum Opus Press in 2008 and a third edition of which was published by Fantasy Flight Games in 2016. Each new edition has largely reprinted the text of the previous edition and then tacked on a number of new variants of the game; the third edition, to my eyes, doesn’t do much beyond offering up an incoherent babble of fairly facile reskins of the basic concept for different genres, a task eminently doable by any reasonably skilled playing group for themselves once the basic concept is mastered. The version reviewed here is the 2nd Edition, from Magnum Opus Press. Interestingly, though it is devoid of dice rolls, is based almost entirely around improvised storytelling, and is entirely GM-less, arguably Baron Munchausen remains an RPG, albeit one which bears almost no resemblance to the traditional RPG format, since it retains the presumption that each of the players is playing a role – namely, the PCs are 18th Century nobles (or at least purported nobles) regaling their peers with tall tales of their exploits. Each person takes a turn to tell a tale, the premise of which is presented to them by one of the other players (story seeds based on the good Baron’s own adventures having been provided in an appendix for the aid of those who cannot think of one on the fly). Each player has a certain number of coins, which they can use to challenge the facts of another player’s story, forcing them to either up the ante with their own coins and refuse to concede the point or accept the coin and come up with some explanation for the disparity in their narrative. After all have told their stories, everyone votes on who told the best story, on a basis of one coin held equals one vote; the winner buys drinks for all and another round is held if the group likes. What is mostly clever and innovative about Baron Munchausen is its presentation, the game being written as though it were penned by the good Baron himself. Whilst I suspect most actual play will find participants referring primarily to the brief summary of the rules, providing them with the Baron’s full digressions, diversions, anecdotes and wool-gathering is a really nice way to set the assumed tone of the material. There are points where Wallis slightly overdoes it, but by and large the prose of the game is nice to read. In terms of game mechanics, what’s mostly interesting about it is that it’s essentially a simplified, cardless riff on Once Upon a Time, the fairytale storytelling card game that Wallis co-designed with Andrew Rilstone and Richard Lambert in the early 1990s. Whereas in Once Upon a Time the cards provide the players with an endpoint they must reach and factors they must work into their stories, in Baron Munchausen all these are provided by the interjection of other players, and whereas in Once Upon a Time everyone’s competing for control of the same story, here everyone has their own story and there is a voting phase to see which is best – but the familial links between the games are evident. My major gripe with Munchausen is the inclusion of the duelling rules. If sufficiently insulted, or if they run out of coins entirely but do not want to back down on a confrontation, a player can fight a duel with another player; this is done by rock-paper-scissors, and the loser of the duel is out of the game entirely. This can happen even if they haven’t even got to tell their story yet, and means that if you’re feeling competitive enough to go for the win and you reckon your story was weak enough that you have little hope of being voted the winner, there’s no point not immediately picking duels to see if you can’t get a win by sheer chance. In general I consider it poor game design to give the players the option to do something which clearly wouldn’t be fun for anyone, especially when it’s not-fun in a way which sabotages the main point of the game: the duelling mechanic allows players to knock each other out of the game on a more or less entirely arbitrary, random basis, doing an end-run around the entire storytelling process which is meant to be the point of the exercise. By and large, the duelling rules are greatly to the detriment to the game, and it’s a mark against Wallis’ credentials as a game designer that he has kept them in place for multiple editions.